However, there are not nearly as many memorable sunrise pictures. Why? Usually, when we think of the photographs that stay with us, those images are taken at a location that is somewhat distinctive. 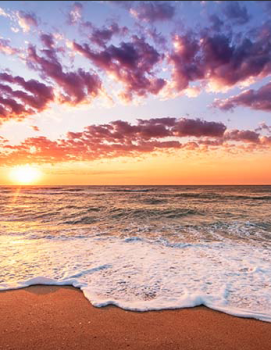 And let’s face it—pointing a camera to the east and watching the sun come up over the ocean doesn’t differentiate easily between Coquina Beach in South Nags Head and the beaches of Corolla. And, of course, the Outer Bank is a vacation paradise, which means relaxation! There are not that many people so anxious to photograph a sunrise that they are willing to get up at 5:30 a.m. to do so. Nonetheless, for the early riser, there are some opportunities to get a very nice and distinctive sunrise shot. Not the lighthouse itself, but the grounds. The lighthouse climbing hours are 9-5, too late for a sunrise and too early for a sunset. However, at the base of the lighthouse, there is a boardwalk that extends into an impoundment. From the end of the boardwalk, there is nothing between you and the sunrise but some marsh grasses and low vegetation on the other side of the water. Another possibility is to capture an image of the sun rising behind the lighthouse. The image captured here will be of the sun rising above the trees of a maritime forest. What makes this so nice is there are docks that will allow the photographer to get away from shore and over the water. Standing on the docks and looking across the water, depending on the time of year, the sun will rise over your left shoulder and slightly behind you. The interplay of the colors of the early morning sun, the shadows of the trees and the water should make for something special. A great place for a very different sunset shot for the same reasons. Because Festival Park occupies a peninsula that looks out across Shallowbag Bay to Roanoke Sound, there are quite a number of possibilities at this location. There is a path that goes around the perimeter of the park, and that is a good choice to find that ideal shot. The path is immediately adjacent to the parking lots, so finding it should not be a problem. The path ends just before the grounds of the outdoor theater and will be facing east at that point. This one is for the early risers as there is some driving involved, but for the truly dedicated, this could be the gold standard. Before US Fish and Wildlife purchased Pea Island, there were a number of hunting clubs located here. To create a better environment for migratory waterfowl, the clubs would frequently build impoundments. When Fish and Wildlife took over, they left the large impoundment intact at their Pea Island Visitor Center. After parking in the Visitor Center parking lot, it will be necessary to walk out until the trail allows a good east facing shot, but given the environment, the extraordinary numbers birds and the setting, there is a potential for something truly special. In the summer especially, insect repellent is a necessity at this location. It is a bit of a drive—drive time is around 40 minutes from Kitty Hawk; about 20 minutes less from Nags Head. Know when the sun will rise and plan accordingly.